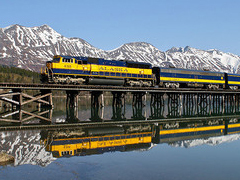 Join our "Great Alaska" Railroad Tour ! The Alaska Railroad visits many great places in "The Last Frontier". You never know what you’ll find! Our Alaska Railroad Packages are multi-day itineraries that include rail travel, accommodations, local transfers and activities for a seamless Alaska adventure. Each day in the summer, the Alaska Railroad departs Anchorage for the journey north to Fairbanks, while a sister train in Fairbanks makes the same trip in the reverse. Along the way, the train stops in Wasilla, Talkeetna and Denali National Park. On a clear day, passengers enjoy spectacular views of Mt. 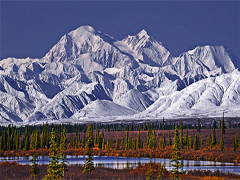 Denali, the tallest peak in North America. Sit back and relax as you travel onboard the Alaska Railroad. Admire the breathtaking nature in either glass-dome or regular railcar compartments, all with large panorama windows that ensure unobstructed views of snow-capped mountain ranges, pristine scenery and wildlife. Relax in your comfortable reclining seats, enjoy a delicious lunch onboard or listen to the narration of the Alaskan tour guide. You may choose from an extensive pre-designed selection of tours or use our complimentary trip planning service for a fully customized Alaska Railroad experience in a world-class destination. An ideal pre-post tour program extension for any cruise ship passengers from Seattle and Vancouver arriving or leaving from Seward or Whittier. You'll leave Anchorage in the morning on board the Alaska Railroad and travel along the Alaska Mountain Range to the magnificent Denali National Park for wildlife viewing and a glimpse of Mt. Denali (formerly Mt. McKinley.) All tours include the local transfers, superior or first-class hotels of your choice, a full day wildlife tour and the Alaska Railroad transportation via Talkeetna. This tour is also available from/to Fairbanks. A spectacular railroad journey along Turnagain Arm and across the scenic Kenai Mountains to Seward. 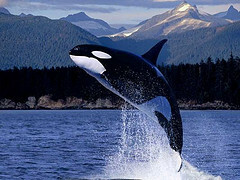 The small fishing community is known as the gateway to Kenai Fjords National Park. Arrive in time for a spectacular 6-hour glacier and marine wildlife cruise. Highlights of the Kenai Fjords glacier cruise: Aialik Bay with its massive calving tidewater glaciers, Orca whale watching within Resurrection Bay, a stopover at Chiswell Island known for a large variety of nestling seabirds and at the Steller Sea Lion refuge. Return to Anchorage onboard the Alaska Railroad. A perfect land program for cruiseship passengers arriving after the Inside Passage Cruise and disembarking in Seward or Whittier. Rail transfer to Anchorage and overnight. The next day you'll leave the city and travel by train across Alaska’s scenic Interior to the magnificent Denali National Park for some exceptional wildlife (grizzly bear) viewing. 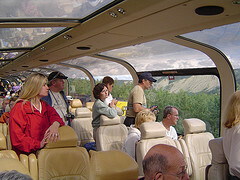 Our tours include local transfers within Denali National Park, superior or first-class hotels at Denali Village, a full day wildlife tour and Alaska Railroad transportation via Talkeetna. This tour is also available in reverse direction. Our "Super Natural Alaska" rail tour provides a glimpse of the most scenic travel destinations of Alaska: including Denali National - and State Park, the Matanuska Valley and magnificent Prince William Sound. Board the train in Fairbanks or Anchorage for a scenic rail trip to Denali and join our Tundra Wilderness and Wildlife Tour with a close-up view of towering 20.230 ft Mt. Denali. Travel via Anchorage to Whittier by railroad for a memorable day cruise to the spectacular fjords and tidewater glacier of Prince William Sound. 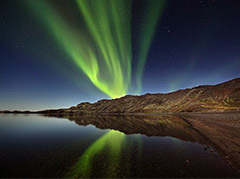 Observe Alaskas most spectacular sceneries from the comfortable wrap-around glass enclosed dome cars or open viewing platforms, enjoy delicious meals at the onboard restaurant or tableside beverage services and stay in first-class resorts and lodges during your entire Alaska vacation. A convenient return flight with Alaska Airlines from Fairbanks to Anchorage provides flexibility to continue your journey, return home or get ready for the once in a lifetime cruise along the Inside Passage from Seward or Whittier to Vancouver and Seattle. Nothing beats the thrill of an Alaska Railroad adventure to the magnificent and diverse Denali - and Kenai Fjords National Parks. Riding the train along majestic mountains, over rushing rivers, and across vast valleys is a once-in-a-lifetime experience. Relax in reclining, forward facing chairs with large picture windows while passing some of the world’s best vistas. Whether as an individual traveler or a cruise passenger looking for a pre- or post- experience, our Alaska Railroad packages are flexible enough to fit any schedule. Autumn in Alaska! 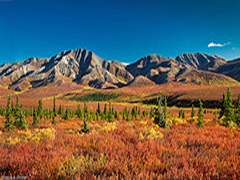 Fall Foliage in Alaska provides equally brilliant symphony of yellows, orange and red fall colors which usually peak in late August and during the first two weeks of September. 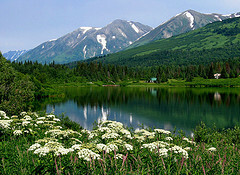 Travelers will be rewarded with glorious views of the Alaska Range, snowcapped Mt. Denali, broad alpine valleys, arctic tundra - impressive views around Broad Pass on the Parks Highway to Denali, excellent wildlife viewing for moose and grizzly bears, as well as fascinating Northern Lights viewing opportunities in Fairbanks and Chena Hot Springs Resort. For many visitors, a trip on the Alaska Railroad is a relaxing way to see some of the most beautiful parts of Alaska without worrying about oncoming traffic! In addition to providing a safe and efficient way to travel, the railroad crew knows where all of the best views are. In fact, there’s a spot north of Talkeetna known as “Kodachrome Corner,” where the train comes to a full stop. On sunny days, there is an unobstructed view of Denali. Everyone takes turns going to the open windows to take the “perfect shot” of the giant mountain. During the summer season, the Alaska Railroad features student guides who share historic moments about the railroad along the way. They’ll also encourage you to point out wildlife to fellow passengers. This includes Dall Sheep and beluga whales along the Turnagain Arm, moose, bears and caribou. You’ll also learn about special features of the railroad, including the giant bridge over Hurrican Gulch, the unique one-lane rail/auto tunnel to Whittier and the unusual “corkscrew” route up to Grandview Glacier on the way between Portage and Seward. Please feel free to contact us if you have any questions.